Improvements to OmniFocus for iOS have opened up a multitude of iOS automation possibilities. Watch this session and learn how to up your game on iOS. If your work is at all repetitive, the time and energy invested to learn and implement automation pays handsome dividends. For example, templates created in Editorial for iOS can be transformed into new OmniFocus projects within seconds. You can choose to be prompted for project-specific information, including the project start and due dates and strings to be inserted into the project (e.g. the name of a client). In addition to dramatically speeding up project creation, this approach is methodical by nature and minimizes the chance of anything slipping through the cracks. How to create projects based on templates using OmniFocus in combination with Editorial for iOS, a plain text editor for iOS that supports automation and the OmniFocus-compatible TaskPaper format. How to create and edit TaskPaper templates on the Mac using TextEdit and TaskPaper for Mac. How to create a TaskPaper template based on an existing project using OmniFocus for Mac. How to automate the creation of OmniFocus projects using Workflow for iOS. How to use Launch Center Pro for iOS to conveniently trigger workflows and quickly access OmniFocus data and features. How to conveniently capture information into OmniFocus using Drafts for iOS. TaskPaper Tags — More information on the TaskPaper format and the tags that OmniFocus supports is available on the Omni Group's Support Site. URL Schemes — Details on using URL schemes for automation are available on Inside OmniFocus. The Automating OmniFocus session covers practical ways to automate OmniFocus on both Mac and iOS. The Using OmniFocus in a Team Setting session shows how the creation of OmniFocus actions can be automated using cloud-based solutions such as IFTTT and Zapier. The Efficient iOS Capture into OmniFocus using Drafts 4 video provides details on how to configure and use Drafts 4 on iOS devices. Joe Buhlig — Has some excellent OmniFocus posts on his blog. 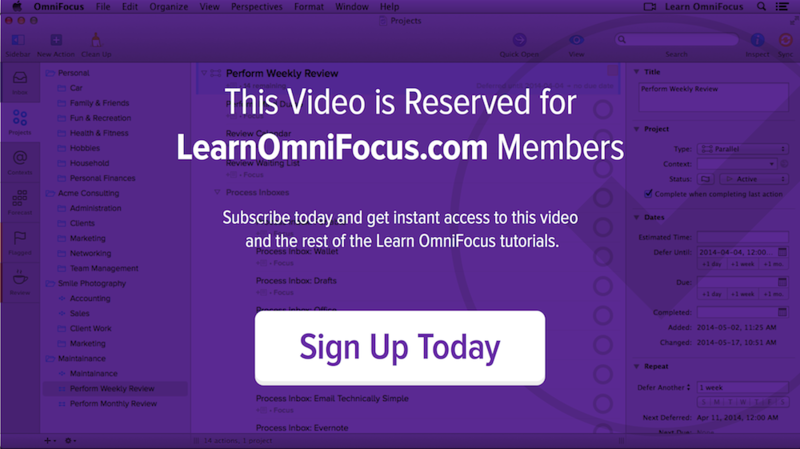 Also check out his excellent Working with OmniFocus book and video series, that includes some great content on OmniFocus automation on both Mac and iOS. This session featured Joe's OF Book Tasks Workflow (Workflows app) and the Multiple Lines in Drafts to Multiple Tasks in OmniFocus Action (Drafts App). David Sparks — If you're interested in learning more about the Workflow app, check out MacSparky's Workflow Video Field Guide. You can watch about eleven minutes free of charge. Consider purchasing this video field guide if you want to take a deep dive into Workflow for iOS. TaskPaper Samples — Drop us a line if you'd like a copy of any of the TaskPaper templates featured in this session.